A couple of days ago we received word a friend of ours suffered a heart attack while undergoing a heart catheterization minutes later he was in surgery in an attempt to save his life. The attempt failed. At first, the connection didn’t sink in but several hours later I began to think about my own heart catheterization in early December and suddenly I realized how fragile our lives really are. I then found myself facing a mystery – Why did our friend die and I did not? I realize there are many variables to consider and perhaps as many explanations but the bottom line is God is the only one who really knows. When I think about the two of us (both Christians) not only did we have a troubled heart in common but we both are recipients of God’s grace (never forget you too are a recipient of God’s grace). As the days go swiftly by I keep running head on with the fact that God and the “things” of God such as grace will always be the greatest mystery of all times. Three take-away values I have gleaned from this exploration into the blessing of grace that can take us to a deeper level of faith and will equip us to live a life based on God’s continued participation in our life are. “Christ gives me the strength to face anything,” the apostle Paul. “Grace is the power of Christ to do God’s will,” James Ryle. 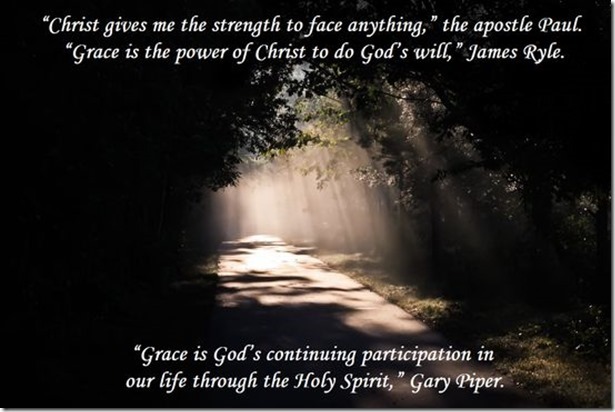 “Grace is God’s continuing participation in our life through the Holy Spirit,” Gary Piper.